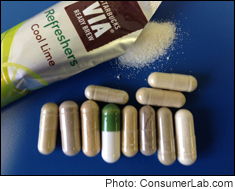 Make sure the green coffee extract supplement you take passed our test and is right for you! Green coffee bean extract (GCBE) supplements may help you lose weight. But ConsumerLab.com found that 50% of the supplements it recently selected for testing didn't contain expected amounts of key chlorogenic acids -- compounds associated with the extract's weight loss effects. Out of the eight green coffee bean extract supplements selected, one contained NO extract and three others contained no more than 14%, 64%, and 82% of expected amounts, based on chemical analyses repeated in two independent laboratories. Fortunately, several high-quality products were found, including some identified through ConsumerLab.com's Quality Certification Program. Among the CL Approved products, the cost to get a 400 mg dose of extract ranged by over 300%, but one cost as little as 20 cents per dose.